Containing only one mineral along with several herbs and salts, Thyroid T-3 Booster is the latest supplement by Absolute Nutrition, a company that focus primarily on dietary supplements to help reduce weight. Absolute Nutrition claims their Thyroid product is Pharmaceutical Grade and boosts Thyroid output and metabolism. We found out that Absolute Nutrition’s product does not live up to its promises. Thyroid T-3 Booster certainly has a few positives, but based on reviews, you should not expect much to happen… except perhaps your wallet might feel significantly lighter. What Is Thyroid T-3 Booster? Thyroid T-3 Booster is a “natural” herbal supplement that is said to boost metabolism and burn fat fast. 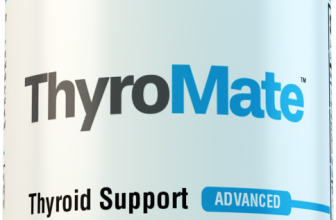 It was designed to help those whose thyroid is underactive or out of balance. The formula was created by Absolute Nutrition and they claim their supplement contains nutrients that increase thyroid output and increase the body’s metabolic rate (without stimulants). 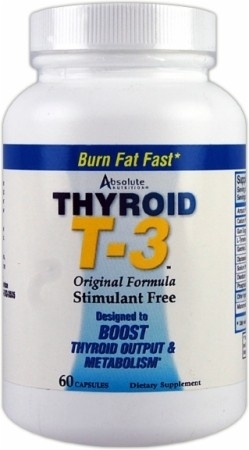 Thyroid T-3 Booster contains Gugglesterone, Tyrosine, Phosphates, Phosphadityl Choline, and Garcinia Cambogia. Absolute Nutrition also states that their product contains no stimulants, wheat, yeast, egg, soy, starch or artificial color. Just from a glance, I noticed that this formula list seemed a little lacking. This is not always a bad sign though; there are great thyroid supplements that don’t bombard ingredients into their formula. But in this case, the ingredients in Thyroid T-3 Booster’s formula do not have a lot of vitamins or minerals. Experience and research tells me that vitamins and minerals are very important in a thyroid supplement and thus having little of these, results in a formula that may not be very effective. This is further supplemented by the fact that are no scientific studies supporting the ingredients that Absolute Nutrition decided to put into their thyroid product on their webpage. Often times, we will see companies link to peer reviewed studies that conclude this particular ingredient was beneficial in helping thyroid support, but in this case, we get no such thing. We tried doing a bit of our own research to see if there were any easily found available studies supporting Thyroid T-3 Booster’s ingredients in thyroid functionality, but we were not able to find any, except for L-Tyrosine. That seems to be the only true thyroid helping ingredient in this product. It seems that they do not share any studies on the other ingredients on how it affects the thyroid. Some of the herbs do have a few studies supporting their weight loss abilities, but only that. It seems from reviews online those who tried this product ended up feeling little to no difference. It seems to me that the lack of research in Thyroid T-3 Booster’s formula may have led to a thyroid product that may not do much for your thyroid. While the herbs and salts may give you the illusion of feeling slightly more relaxed, but the effectiveness for your thyroid is not supported by studies on most ingredients. We certainly do not recommend this product when there are a lot better thyroid support supplements out there that do a lot more, for a lost less of your money.